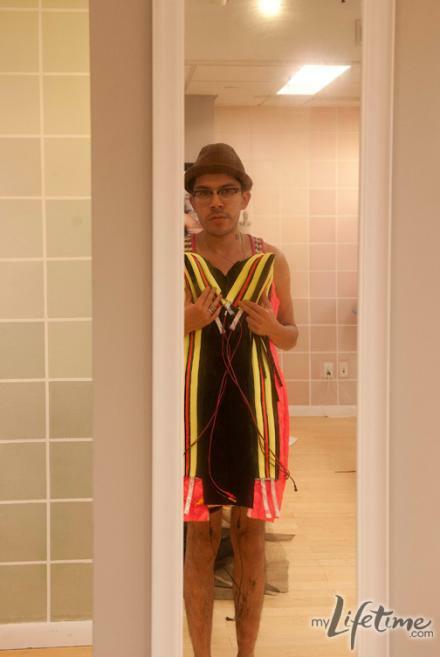 I love Austin, but often felt his garments this show missed the mark time and time again. I don't know if it has been the pressure, that the challenges don't suit his abilities or if his target client that he designs for in real life is widely different from what they are looking for on the show. I have been surprised to see him still here. But this week he took the challenge by the horns and finally came into his own. Kudos! 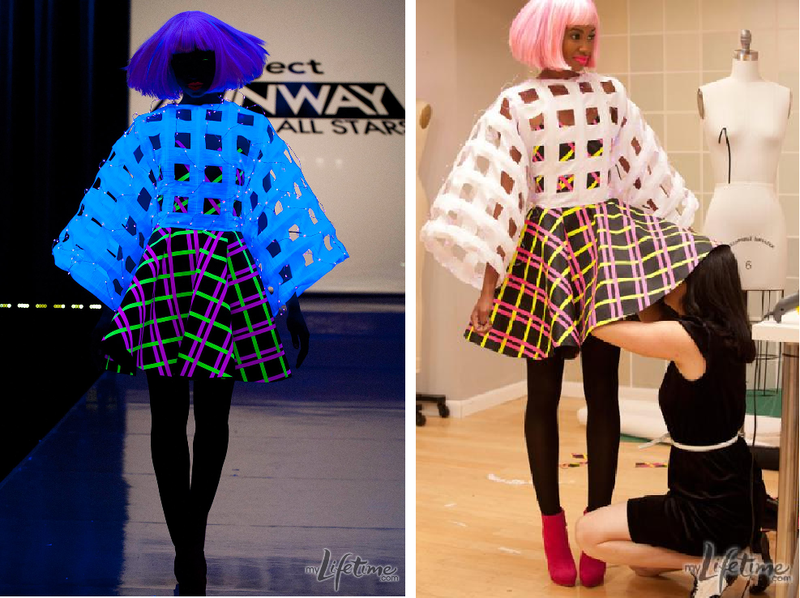 For episode 9 the designer had to create an avant garde garment using lighting technology. The guest judge was Pharrell Williams and the winning look would be worn by one of his celebrity clients. First stop was the Barbizon Lighting Company. I have to admit I was impressed with the wide range of lighting options available. I suspect each of the designers would have liked a little more exposure on how this amazing array could be used, but true to reality TV, they were thrown in the water with no life jacket. It would have been impossible for them to do any design work before seeing the lighting option, so they really had to think on their feet. Most went for the wow factor, but Austin dreamed of fairies and selected delicate options without colour. Then off it was to Moods for the accompanying fabric. I loved the fact they gave them hand-held black lights to check how the fabric would look on the runway. A side room was also created back at the studio with black lighting so the designers could go in and fine-tune. A great bonus that some used more than others. Top 3 for me seemed to be in line with what the judges felt this week and I agreed completely with the winner. Austin was true to form and created fantasy. In the workroom you could easily see the garment was really just netting and a frame to hold the delicate lighting into it's starry final shape. But on the runway with black lighting, one dreamed of fairies in a dark forest. I loved the way the fragile lights swooped up over the model's head and the single strand draped under her chin. They created an appealing glow on the neck and shoulders. Kenley went for more drama, She created her own labour intensive plaid fabric out of lighting strips as the base. From this came a dress in Kenley's normal go-to silhouette. But she mixed it up by creating an unusual over jacket of latticework fabric with tiny lights woven in to create sparkle. It was a strange mix of a kimono-type silhouette over a traditional Kenley flaired skirt that for some odd reason worked. My only complaint? I think the lights were too tiny on the jacket to actually show. You can see them in close-ups, but on the runway they were non-existent. Mondo, as always, was edgy. The judges did question how avant garde this was, but I think it fit the bill according to the designer's own funky aesthetic. The bodice sported a strange pointy bra shape, the lighting - both tape and strings artfully encased - was used well, although the silhouette down the sides could have used a bit of tapering in at the waist to avoid that blocky look. So after several wins, he did miss the mark on this one a bit, but still rose to the challenge well enough to move continue on another week. Michael had a great idea. I was glad he didn't do the draping thing another week and stepped out of the box to create a structured silhouette. The problem was it ended up being just a bit too costume-y over all. 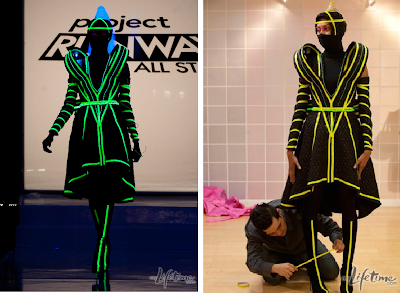 It looked like a Samurai warrior for Tron. If he had been able to edit the design so that it was still infused by this inspiration but with more of a fashion editorial look, he would have had something there. I applaud his taking a risk by trying something new, just sorry it didn't gel. Jerrell was sent home this week. At this level there is no one doing a BAD job with a capital B. There are those small details that set each designer apart. 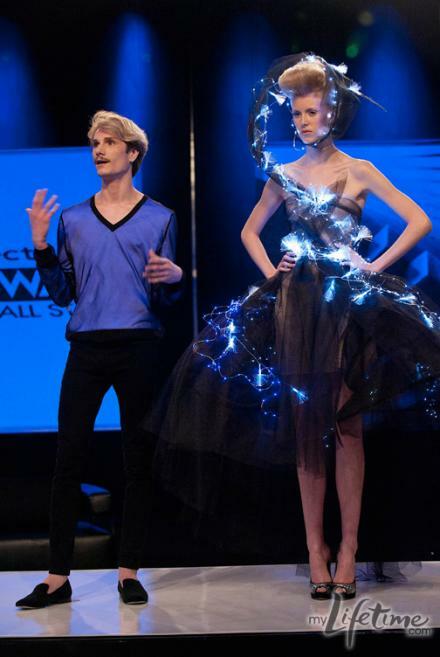 First what I loved - his use of optical fibre lighting which created movement as the model walked the runway. He was the only designer to use them. What the judges didn't like was the black pencil skirt thrown in and the over-the-top styling. Those weird glasses in particular reminded me of a costume for a black light Jetson's movie. I also felt the design was over busy in the middle. If he made the skirt a bit more subtle and spread out the lights more instead of bunching them at the hips and shoulders, the outfit might have been more balanced. I am sad to see Jerrell go as I do like his point of view, but in general don't think he has excelled this season at the challenges. Monday night will be episode 10 where they determine who will be in the final. I wish it was Mondo, Rami and Kenley - just a great mix of aesthetics and talents - but that is clearly not meant to be. So crossing my fingers that whichever 3 are chosen, the challenge will be deeply inspiring to each of them so we can enjoy their best work yet.